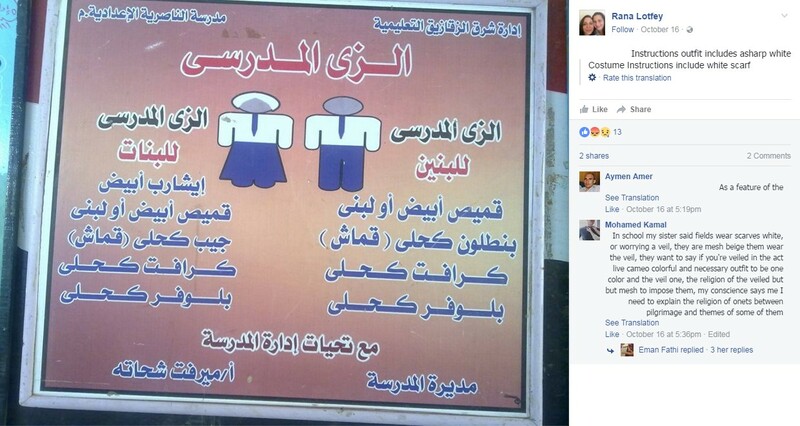 This article claims the following banner mandates the hijab (an Islamic head-cover) and it was posted outside Egyptian schools. A banner mandating the ‘hijab’ has been posted outside schools. The same article is posted in this and this site. This photo was taken by Lamya Lotfey, a Egyptian Coptic Christian. She posted this photo in her Facebook public profile on Sunday, October 16, 2016 at 5:01 pm (according to GMT +6, timezone of where I live). 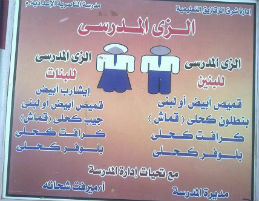 According to my native Arabic speaker friend, the photo is "instructions how the dress of school must be." The photo was then published by AL Ahram newspaper (credit to DavePhD) with the following caption. A sign stipulating Islamic veil as a mandatory part of girls' dress code at a school in Egypt's Sharqiya governorate. Archive.org link to original photo. The image is that of "A sign stipulating Islamic veil as a mandatory part of girls' dress code at a school in Egypt's Sharqiya governorate". Not the answer you're looking for? Browse other questions tagged islam egypt . Does polygamy result in less infidelity and prostitution? Have edible jars of honey been found in thousand-year-old Egyptian tombs?